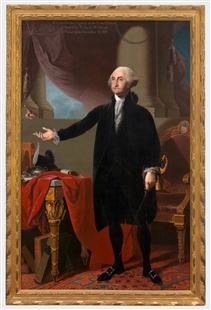 Painted after the famous Gilbert Stuart Lansdowne portrait, this version of George Washington took an unconventional route to the Capitol. 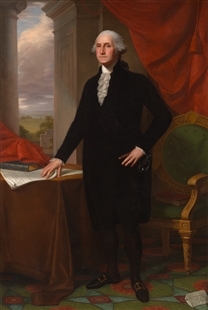 The painting was originally owned by Richard W. Meade of Philadelphia, who gave it to the American Embassy in Madrid in 1818, as described in the inscription at the top of the canvas. More than 100 years later, it was brought to Washington from Madrid at the behest of Representative James Fulton and was hung in Statuary Hall in 1951. 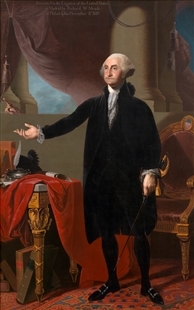 As in the Stuart version, Washington is posed with one hand on his sword, the other outstretched in a traditional rhetorical gesture, as if he were addressing an audience.